I blanch asparagus, just about anytime I’m cooking for a dinner party, and many times when it’s just my wife and I. Blanching the asparagus, allows you to cook it most of the way well in advance, which is a huge time saver when I need it and n this cooking technique video, I show you how to do it.. You can get the asparagus 90% cooked in the afternoon, and then just finish it off right before serving; making your life easier at party time. Blanching also helps presentation. Asparagus is one of my favorite spring vegetables, but like just about all green vegetables, the longer you cook them, the more you lose the bright attractive green color, and get more of a drab looking green. 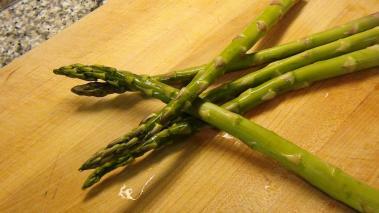 By blanching, then shocking the asparagus, you “set” that nice green color, and they are more attractive on the plate. You’ve got blanched asparagus!! When you’re ready to cook them, take them out of the fridge and finish cooking – which will only take a minute or so. You can use this same technique with tons of vegetables…Hope you enjoy!